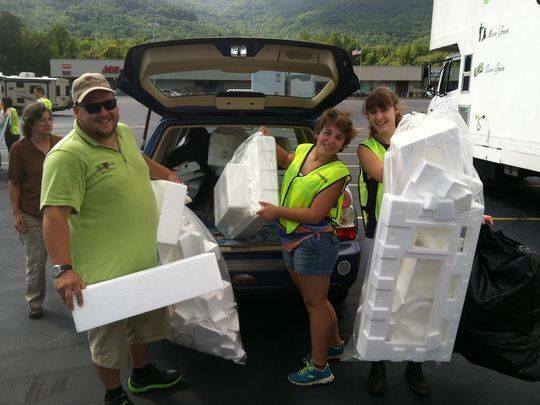 Do you have a collection of styrofoam packing materials, obsolete electronics, or other hard-to-recycle stuff? Now is your chance to rid your home of clutter and provide items that can be recycled and/or reused by others. Asheville GreenWorks will sponsor a Hard-2-Recycle event in Swannanoa on Saturday, September 15, in the parking lot at Madden Ace Hardware, 2319 U.S. Highway 70. You can drop off your recyclable items at any time between 10 a.m. and 2 p.m.
For more info, call Asheville GreenWorks at 828-254-1776. For a list of items that will be accepted for recycling, please visit www.ashevillegreenworks.org/hard-2-recycle.